Hornady’s Superformance line is well known for increasing the power and overall performance of cartridges subjected to its battery of enhancements. The .300 Win Mag is no exception to this genetic enhancement program. 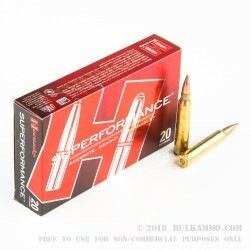 With their bullets being fired at 100–200 feet per second faster than conventional ammo, Hornady’s Superformance rounds provide terminal behavior and accuracy unmatched by competitors. These .300 Win Mag Superformance cartridges are loaded with 180-grain Super Shock Tip round bullets. Super Shock Tips are specially designed polymer-tip bullets which also utilize a cannelure to keep the core and jacket in one piece, as well as a boat-tail profile to improve aerodynamics. All these features come together to create a premium ammo which performs like no other, outpacing its competitors in more ways than one. 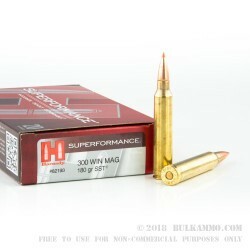 Hornady’s .300 Winchester Magnum Superformance SST travels at 3,130 feet per second out of the barrel and produces 3,917 foot-pounds of energy at the muzzle. It’s loaded with a 180-grain Super Shock Tip bullet, specially designed by Hornady. 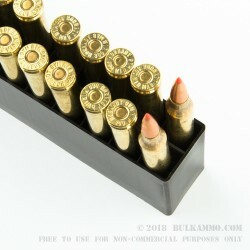 The boxer-primed brass casings are safe for reuse.